The pursuit of domestic and continental glory is keeping VfL Wolfsburg’s Nilla Fischer more than occupied at present, though there might just be a way for the Sweden star to enjoy some musical escape with one of her talented compatriots. At international level, midfielder-turned-defender Nilla has made her mark over a number of years and various major tournaments. The 29-year-old was one of ten players nominated for the 2013 FIFA Ballon d’Or, along with Sweden teammate and captain Lotta Schelin. The ex-LdB Malmö player has also been involved at two World Cups, two European Championships and two Olympic tournaments. Her performances at Euro 2013 for host nation Sweden were pivotal in coach Pia Sundhage leading her country to the last four. Nilla, who has taken up a centre-back role in recent times, scored three goals in the tournament as the Swedes were stopped at the penultimate hurdle by winners Germany. Last year also saw the former Vittsjö youngster leave Linköpings in her homeland to play her club football with VfL Wolfsburg. The Green-Whites had a sensational season last time around, winning the treble – the Frauen-Bundesliga, the DFB-Pokal (German Cup), and the UEFA Champions League. At the weekend, Wolfsburg booked their place in the Champions League final once more as they overcame Bundesliga title rivals Turbine Potsdam 4-2 in the semi-final’s second leg. The team, led by Ralf Kellermann, will take on Swedish side Tyresö in the final in Lisbon on May 22nd after they ousted Birmingham City. Nilla is known to many as a strong organiser and competitor, with impressive aerial ability and a taste for the big games. Besides discussing matters on the field, I like to also uncover more of the person behind the athlete in the interviews on here, talking with the players about music. For Nilla, it definitely plays its part from one day to the next. “I like all sorts of music but my favourite genre is r&b. Some of my favourite artists are Rihanna, Beyonce and Whitney Houston. Nilla has been a commanding presence in the Swedish national team for a number of years so it is maybe quite difficult for her supporters to picture her taking on a task as mundane as cleaning! While with Malmö, she won the domestic title (Damallsvenskan) in 2010 and 2011, before switching to Linköpings. She is not the only Swede to ply her trade in Germany, and Bayern Munich have one of her compatriots for example. This player is a 23-year-old midfielder and others have drawn attention to her musical talent on here in the past. Nilla named her as the career teammate she would select to record a cover of a song with. As Tyresö beat Birmingham 3-0 in the second leg of their Champions League semi-final, they were led from midfield by captain Caroline Seger. The 29-year-old is one of Sweden’s most experienced and important players and Nilla reveals one of her other talents. “I’ve played with a few really good singers. Olivia Schough is really good! Euro 2013 was Sweden’s first tournament under the guidance of highly successful former US Women’s National Team coach Pia Sundhage. Throughout the competition, Nilla was deployed in a central-defensive role alongside Charlotte Rohlin. Spending her whole career to date with Linköpings, local-born Rohlin captains the club, although Nilla took over this in her absence after she suffered an ACL injury. Another of Nilla’s teammates at Linköpings was England and Manchester City WFC goalkeeper Karen Bardsley. She was a recent interviewee on here and Nilla was one of the players she mentioned for their influence on the music when the team are preparing for a match. Nilla has also said before how she and ‘KB‘ share the same humour, so that must certainly mean life is rarely dull around the pair! Involved in the senior national team since her debut in 2001, Nilla gives an insight into who the main players are for choosing the playlist in the changing room. “Well, I played a lot together with Therese Sjögran and she’s been the DJ both in the club and national team. She likes dancefloor music, with a lot of bass in the songs! 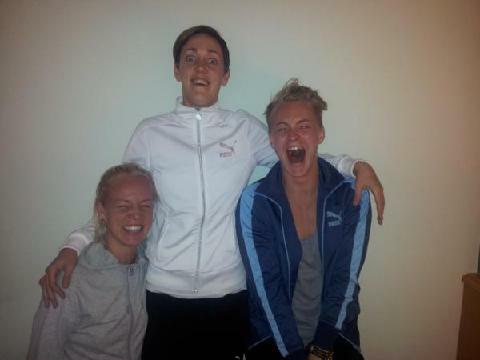 Photo: (From left to right) Caroline Seger, Therese Sjögran and Nilla. Therese Sjögran is a name needing no introduction for those who are familiar with the Sweden team and she was a teammate of Nilla’s at Malmö. The club is now known as FC Rosengård and midfielder Sjögran, who became the most-capped Swedish player in 2013 with 187 appearances, gives invaluable experience and ability to a group with plenty of talent. When she arrived at Malmö in 2003, ex-Kristianstads player Nilla was still a teenager. Over the coming years she would rise to prominence of course and she had a daring way of introducing herself, taking the common singing initiation to a different level with the content she came up with. “When I was a new player in Malmö I had to sing a song that I had written myself. I tried to rap, very bad, and it was about the girls in the team. The 2011 World Cup was Nilla’s second following a below-par 2007 tournament for the Swedes as they failed to make it out of the group phase. 2011 was much more prosperous though, as they clinched third place, losing to winners Japan in the semi-final and defeating France for the Bronze. Sweden had won their group and a 2-1 victory over the US was crucial in that achievement. 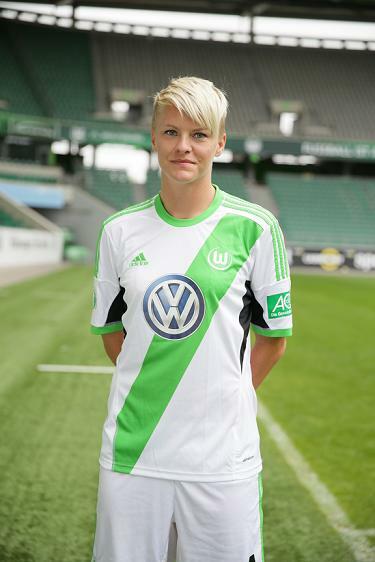 In the game, Nilla got a decisive goal in Wolfsburg, adding to the lead established through Lisa Dahlkvist’s penalty. Abby Wambach got one back for the US but it was not to be sufficient. The Americans were on the wrong end of the result again when the two teams met in this year’s Algarve Cup in Portugal. Nilla played the full game as Sweden ended the US’ 43-game unbeaten run, with the winner coming from Lotta Schelin. As a final word on music, it was an American artist and one of Nilla’s favourites to this day who took the honour of being the first record she ever bought. Before this season’s exploits with Wolfsburg, Nilla was helping Sweden to the last four of Euro 2013. Although playing at the back, she scored the equaliser in the 1-1 draw with Denmark in the group opener and also struck two in the 5-0 win over Finland. There has been a German club in the final of European football’s premier women’s competition since 2008 and Wolfsburg ensured that would continue this time too. On the domestic front, the Green-Whites are currently 3rd in the Frauen-Bundesliga having played 15 games. They are four points behind 2012 champions Turbine Potsdam (in 2nd) and seven behind leaders Frankfurt, who have played two more games. 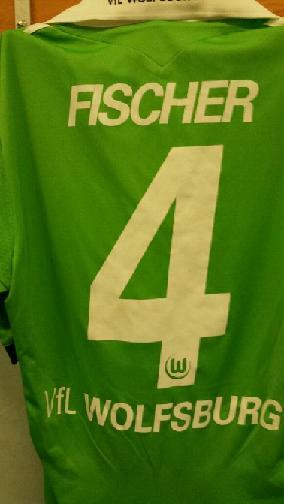 If Wolfsburg can win the Champions League next month they will become the first German team to retain the trophy. Players like captain and Germany midfielder Nadine Keßler certainly give them a chance and Nilla’s success in Sweden, as well as playing in World Cups, European Championships and the Olympic Games, can only be helpful. Nilla evaluates what it is she feels her career has taught her so far and also tells of why moving to Germany has been enjoyable for her. “It takes a lot of effort and hard work to get you to where you want to be. 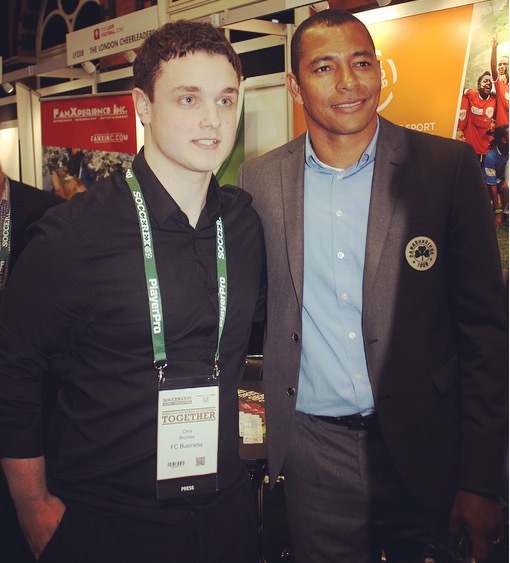 The soccer life has taught me to adapt to new environments and new people. Double-winning glory is on the horizon for Nilla and her teammates if they can overpower their Bundesliga competitors and also hold their nerve against Tyresö. Right now though, let’s ask Nilla to cast her attention back over her career up to now. In each interview, the player is asked to choose a 5-a-side team (including themselves) made up of the best they have ever worked alongside. Nilla names her chosen four and it is a decidedly international line-up, with one from Iceland, an American, a German, and of course, one of her fellow Swedes. “Thora Helgadottir – a goalkeeper with fast reflexes and good technique. Denise Reddy – a hard defender that hates to lose and loves to win!